USC has had UCLA‘s number the last three times these teams have faced off, and even though the Trojans stand at 5-5 while the Bruins are at 2-8, this rivalry never bores its audience. However, their combined 13 losses is the most in the game’s 88-year history. The Trojans lead the overall series 49–31–7, and coach Clay Helton hopes to make that 50 wins so his seniors can claim the famed rivalry’s award — the Victory Bell — one more time. “The only pressure I feel is to help a bunch of seniors and a bunch of kids go out and get the Victory Bell one more year,” Helton said. Coach Helton has been on the heels of a disappointing season for the Trojans, as has UCLA’s Chip Kelly in his first season on a five-year deal with the Bruins. USC is currently favored by just 3.5 points, as these albeit different style teams may perform at similar levels on Saturday. Freshman quarterback JT Daniels, a former Mater Dei star, has not had a breakout game yet, and UCLA’s quarterback situation is equally in question following injuries. As a matter of fact, Daniels is not the only local high school star to make it to the college stage also in Los Angeles. 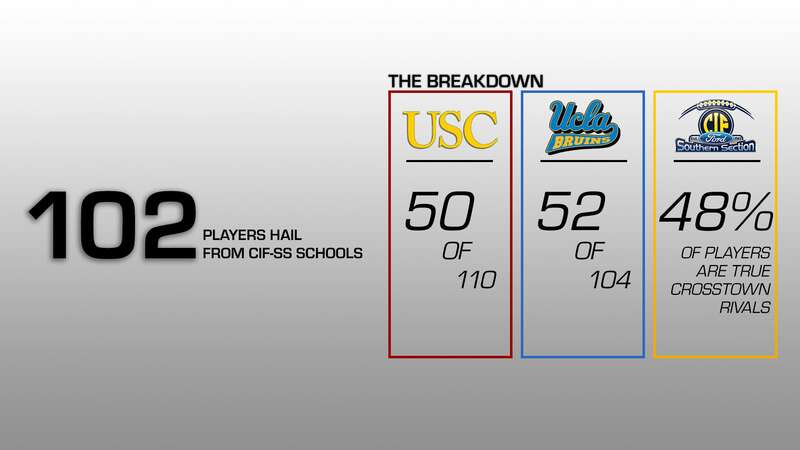 In fact, both USC and UCLA have a lot of players from the CIF Southern Section schools. While their offenses are producing similar numbers, each averaging about 370 yards a game, USC is allowing about 70 less yards given their powerful defense. Add this to the intense rivalry these schools have with one another, and this could end up being the great game people hope every year it is. 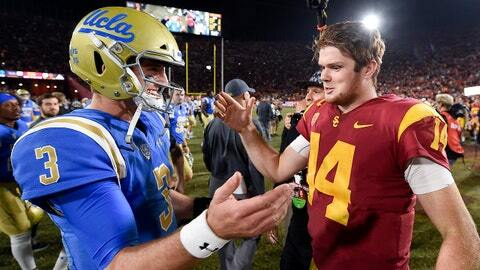 USC held on at the Coliseum to beat UCLA last year and continue on with their impressive season in this one, also signaling the end of the Sam Darnold-Josh Rosen era. Darnold is now starting for the New York Jets while Rosen is now the one wearing red for the Arizona Cardinals. With both teams ranked in this 2012 game, the stakes were insurmountably higher than they will be on Saturday, but whenever it’s Trojans vs. Bruins, an emotional, intense game can be expected.